Did you know YOU can hear God’s voice? You can! I believe it is our right and our inheritance to hear God’s voice. In John 10, Jesus talks about being the Good Shepherd. He says He knows His sheep and they know Him. His sheep know His voice! God speaks to us in many different ways. Primarily, He uses the complete and inerrant written Word. The Word of God is the final authority by which we filter everything else. If we feel God is speaking to us, what we are “hearing” MUST line up with what was already written in the Word. What God impresses upon us will NEVER contradict what He has already said in His written Word. For example, He will never tell a married person to get into a relationship with another person while they are still married. There are two words in Greek for “word” (logos and rhema). There may be more, but those are the two I want to focus on today. God takes the logos (written word) and illuminates it to our spirits through the rhema (spoken word) so we can apply it to our situation. The Bible is alive. it is not simply black ink on white paper. Rarely, if at all, will someone hear God’s voice audibly. That’s not to say that God can’t. He just doesn’t usually. More often than not, when we say we “hear” God’s voice, we mean we heard Him in our spirits. I long to hear His voice; don’t you?! There is nothing like it. Just today I heard God speak to my heart. I have been pretty discouraged about some health issues I’ve been having for a while. I’ve prayed. My husband’s prayed. We’ve sought the Lord together about it. I’ve had doctor visits, etc. But I heard God tell me today, “C’mon, Baby Girl! You and I will do this together. It’s not going to be easy. It’s not going to look like you thought. But we are going to do this together.” When He says we are going to do this together, He does His part, and my part is to obey and do what He says to do each step of the way. I, in no way, think my healing will come from something I do. Within an instant, I was no longer discouraged! I still have to exercise. I still have to lose weight. I still have to do what I know I’m supposed to be doing, but I was no longer discouraged. There are many examples in the Old and New Testaments of ordinary people hearing the extraordinary voice of God. Today, I want to talk about one example found in the Old Testament. 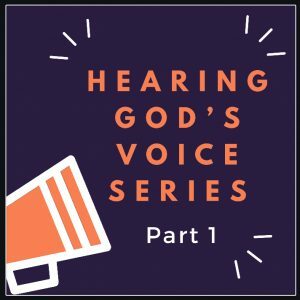 In 1 Samuel 3, we read about Samuel hearing God call him. Samuel heard God’s voice, but he didn’t recognize it right away. That tells me that we can mistake God’s voice for someone else’s or even our own. “The boy Samuel ministered before the Lord under Eli. In those days the word of the Lord was rare; there were not many visions. One night Eli, whose eyes were becoming so weak that he could barely see, was lying down in his usual place. The lamp of God had not yet gone out, and Samuel was lying down in the house of the Lord, where the ark of God was. Then the Lord called Samuel. Samuel answered, ‘Here I am.’ And he ran to Eli and said, ‘Here I am; you called me.’ But Eli said, ‘I did not call; go back and lie down.’ So he went and lay down. This happened again and again (three times) until finally, Eli realized that it was the Lord calling Samuel. God then went on to tell Samuel all that He was going to do to Eli and his family. Eli was guilty of letting his children sin without restraint. Eli did nothing about it. When Samuel returned, Eli pressed Samuel to tell him everything God had said. So Samuel told him everything. Eli’s response was an acknowledgment and conviction that what God said was true. Samuel heard God’s voice, but he mistook it for Eli’s. He needed to LEARN to hear the voice of God. Let’s fine tune our ears to hear His voice. Reading Scripture is the best way to finetune our spiritual ears to hear His voice. We can’t always listen to what we want to hear. The Bible talks about in the end times, people will not put up with sound doctrine but surround themselves with teachers who will tickle their ears. We must listen for His conviction as well. Whenever we hear God’s voice whether it be a rebuke or an encouragement, it is ALWAYS lifegiving! Tell me in the comments how you’ve heard God’s voice recently! Was it an impression? Was it something directly from Scripture? Was it a feeling He wanted you to act upon?